If you are faced with bird infestation, then we are here to offer you with professional bird extermination services in Ottawa. Many might dismiss infestation by birds but it will interest you to note that there are certain types of birds that are disease carrying vectors and they can pass over these diseases and cause a number of ailments to people. Besides, when you have a lot birds around, their droppings are very unsightly and has the potential to damage the beautiful finishing of your home. 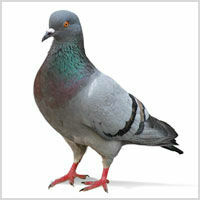 You therefore need to seek bird control services the moment you recognize that you have an infestation. But how do you recognize bird infestation? It shouldn’t be difficult to know whether or not your premises have been infested by birds. The presence of many birds hanging around your premises should be a signal that an infestation is already in progress and it would be a good time to seek bird infestation control. Also by visual inspection, you can recognize bird droppings especially in the places where they roost or feed. Due to the laws revolving around the protection of animals and especially birds, it becomes imperative that you should only work with a company who understands all the intricacies as well as the legal aspects of controlling bird infestation. Our team has been conducting bird pest control services for over two decades now and we understand all the tiny legislations that dictate how the exercise should be conducted. All the methods we use have been approved by law and you can be sure that there will be no liability on your part for whatever actions we use in controlling the infestation. 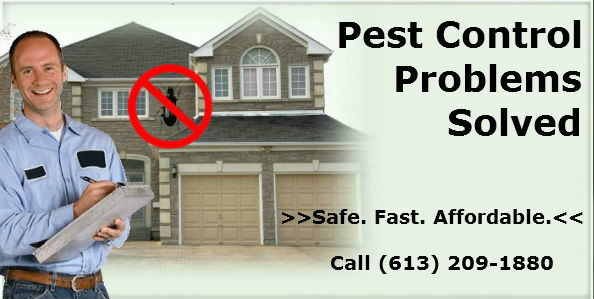 You can therefore rely on Pest Control Ottawa to use safe and humane methods that are legally backed to end your bird infestation problems. Contact us today for more information on how our services can be useful in helping you end bird infestation in your premises. Our service area includes Ottawa, ON and the surrounding areas. 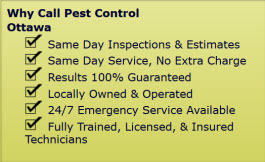 Bird Infestation Control Services in Ottawa, ON call (613) 209-1880.